Seven games. Seven draws. And the World Chess Championship in London, between the two top-rated grandmasters in the world, remains level with five games to go. Magnus Carlsen of Norway, 27, is No. 1 and trying to successfully defend his title for the third time. Fabiano Caruana of the U.S., 26, is No. 2 and trying to become the first American world champion since Bobby Fischer in 1972. On Sunday, Carlsen marshalled the white pieces and Caruana the black. The first nine moves of Game 7 exactly matched those of Game 2, which ended in a 49-move draw this past weekend. These moves fall into a category of chess opening called the Queen’s Gambit Declined, Harrwitz Attack. In 1858 in Paris, Daniel Harrwitz deployed his eponymous attack to victorious effect in a game against Paul Morphy, the great American player and unofficial world champion. But “Attack,” in Sunday’s case, was a bit of a misnomer. “What I did was just way too soft,” Carlsen said after the game. The game’s brakes locked in this complex position, and moves 12, 13 and 14 alone took an hour and a half to complete as the players each contemplated a number of plans. But the game never really appeared to anyone like anything but a draw. (I’ll renew my pro tip here: If you want to sound smart about a championship chess game, just say it “looks drawish.”) In an interview at the venue in London, Demis Hassabis, the co-founder of DeepMind and co-creator of the impossibly strong chess-playing program AlphaZero, predicted a draw at this point. Bookmakers put the live chances of a draw at around 97 percent. The supercomputer assessed it at 0.00 — dead level. And Maxime Vachier-Lagrave, the world No. 6, predicted a draw within the next half hour on a Chess.com broadcast. But Carlsen wasn’t quite done yet. The sucking took more than half an hour, but the vampiric approach drew no blood on Sunday. All four rooks had came off the board in quick succession around move 20, and the queens were cleared a dozen moves later. Caruana, for his part, was playing like he was happy with a draw, and why not? He’d survived a mid-series gauntlet where he had to play two games in a row against Carlsen and the white pieces and their first-move advantage. Carlsen and Caruana agreed to a draw on the 40th move after about 3.5 hours of play. We’ll keep the chart below updated throughout the match. Someone will win eventually. If the 12 games end with the score tied — a possibility that is drifting toward a probability — the two grandmasters will play a tie-breaking series of much faster “rapid” and possibly “blitz” games — and possibly even an “Armageddon” game. According to the live world ratings, Carlsen is the No. 1 rapid player and the No. 1 blitz player in the world. Caruana is No. 8 and No. 16, respectively. 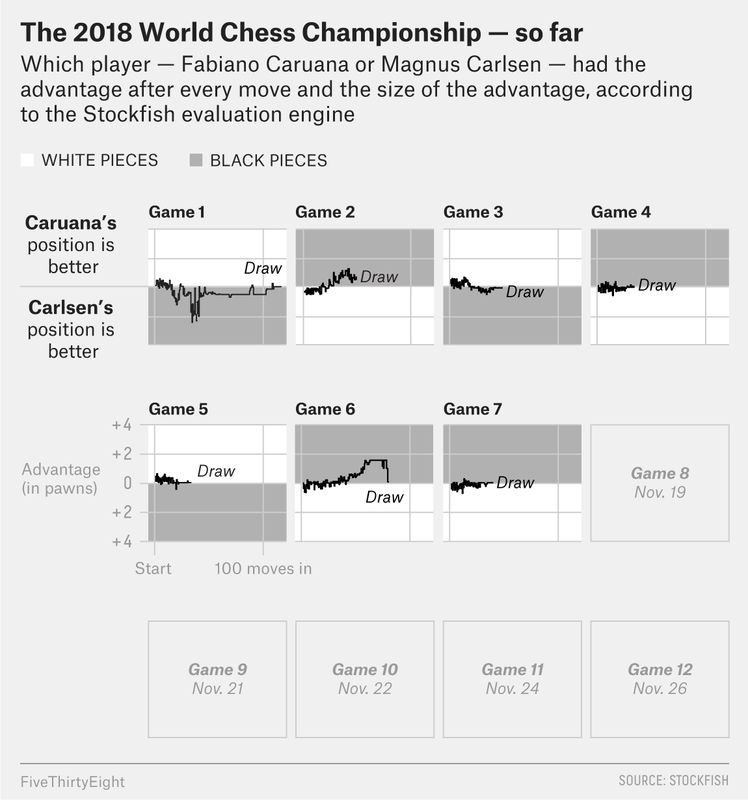 Given that Carlsen would be the heavy favorite in the tiebreakers, meta-match strategy seems to dictate that Caruana should favor the gas pedal in the five lengthy games to come. If he has any secret attacking weapons, the time has come to fire them. Watching every second of this match has taken on the cast of a Buddhist meditation — the games are drawn and the mind is cleared and the mantra is repeated. It is, frankly, a rather lovely routine and a cheap bit of self-care. I’ve also been starting to dream about this match. Last night’s installment featured Caruana and an unidentified friend sitting on the ground in the center of a large complex of tennis courts, with me on the outside of its chain link fence, looking in. Players on these courts were equipped with strange wooden spatulas, rather than racquets, and white tennis balls. Caruana and friend had given up playing this weird quasi-tennis, cast their spatulas aside and sat playing with purple Gameboys. What does this augur for the rest of the match? I do not know. Freudians, get in touch. Game 8 begins Monday at 3 p.m. Greenwich Mean Time — that’s 10 a.m. Eastern. I’ll be covering it here and on Twitter.